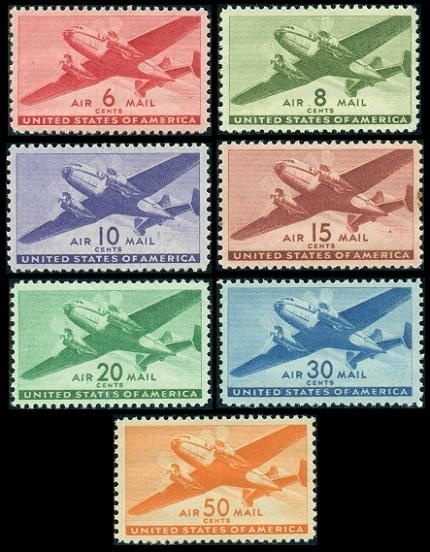 New definitive US airmail stamps appeared during 1941, with the varying denominations featuring a large transport aircraft. As it turned out, at the end of the year, the United States would be drawn into World War II and hundreds of millions of these new airmail stamps would be required for mailing letters and packages to US military personnel all over the World. 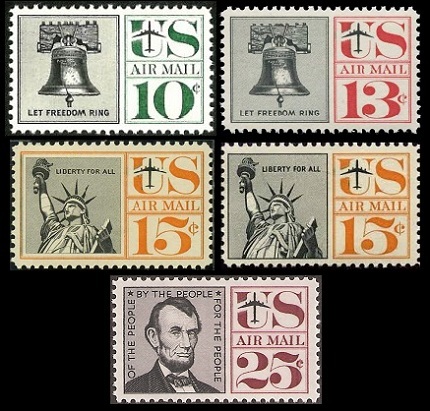 The ensuing years would also witness the issues of commemorative and peacetime themed US airmail stamps. As with the regular commemorative and definitive postage stamps of the 1950's and 1960's, rising postage rates and new mail handling technologies would also result in quite a few airmail stamp re-issues and printing varieties. For an explanation of Wet Printings, Dry Printings, and Phosphor Tagging, please see the General Issues 1954-1968 page in this website category. The phosphor tagging on US airmail stamps is orange red, whereas the tagging on regular stamps is yellowish green. 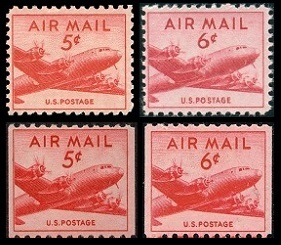 The seven definitive US airmail stamps shown above (Sc. #C25-31) were all issued during 1941, with the exception of the 8 C. denomination, which was issued on March 21, 1944. The uniform designs of these airmail stamps features a twin-motored transport aircraft. Being the most frequently used denomination of the series, the 6 C. denomination airmail stamp was also issued in booklets, containing panes of three stamps, on March 18, 1943. Almost five billion of the 6 C. denomination airmail stamps and almost two billion of the 8 C. denomination airmail stamps were printed, as opposed to the other airmail stamp denominations, which ranged from about 11 million to about 78 million. The 5 C. denomination sheet-format definitive airmail stamp, shown at top left (Sc. #C33), was issued on March 26, 1947. The 5 C. denomination coil-format definitive airmail stamp, shown at bottom left (Sc. #C37), was issued on January 15, 1948. The 6 C. denomination sheet-format definitive airmail stamp, shown at top right (Sc. #C39), was issued on January 18, 1949. These stamps come in both wet and dry printings, with the dry printings being the scarcer of the two. The 6 C. denomination sheet-format definitive airmail stamp was also issued in booklets, containing panes of six stamps (Sc. #C39a), on March 18, 1943. The 6 C. denomination coil-format definitive airmail stamp, shown at bottom right (Sc. #C41), was issued on August 25, 1949. All four of these new, smaller-sized, definitive airmail stamps feature a DC-4 Skymaster. 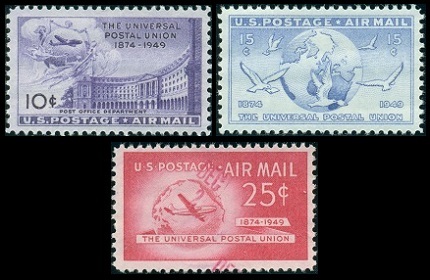 The three peacetime-themed definitive US airmail stamps shown above (Sc. #C34-36) were issued during 1947. These stamps come in both wet and dry printings, with the dry printings being the scarcer of the two. 10 C. - Pan American Union Building, Washington, D.C. and a Martin 2-0-2. 15 C. - Statue of Liberty, New York skyline, and a Lockheed Constellation. 25 C. - San Francisco - Oakland Bay Bridge and a Boeing B377 Stratocruiser. 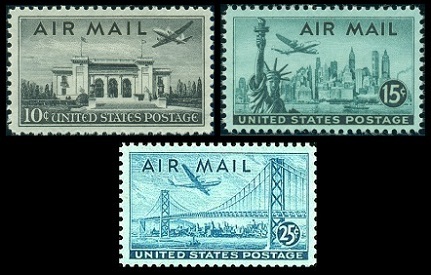 The three commemorative US airmail stamps shown above (Sc. #C42-44) were issued during 1949, to celebrate the 75th Anniversary of the Universal Postal Union (UPU). 10 C. - U.S. Post Office Department Building in Washington, D.C.
15 C. - Globe and doves carrying messages. 25 C. - Globe and Boeing Stratocruiser. The 80 C. denomination definitive airmail stamp shown above, at the left (Sc. #C46), was issued on March 26, 1952. This stamp was issued to pay the airmail rate for shipping orchids to the United States mainland. The design features Diamond Head, Honolulu, Hawaiian Islands. The 6 C. denomination commemorative airmail stamp shown above, at the right (Sc. #C49), was issued on August 1, 1957 to celebrate the 50th Anniversary of the United States Air Force (U.S. Army Air Corps). The design features a B-52 Stratofortress and three F-104 Starfighters. The 4 C. denomination definitive airmail stamp shown above, at the left (Sc. #C48), was issued on September 3, 1954. The 5 C. denomination definitive airmail stamp shown above, at the right (Sc. #C50), was issued on July 31, 1958. These stamps were issued to pay the current domestic airmail post card rate during 1954 and again during 1958. The designs of these two US airmail stamps feature a Bald Eagle in flight. The blue 7 C. denomination sheet-format definitive airmail stamp, shown at top left (Sc. #C51), was issued on July 31, 1958. This stamp was also issued in booklets, containing panes of six stamps (Sc. #C51a). The blue 7 C. denomination coil-format definitive airmail stamp, shown at bottom left (Sc. #C52), was issued on July 31, 1958. The carmine 7 C. denomination sheet-format definitive airmail stamp, shown at top right (Sc. #C60), was issued on August 12, 1960. This stamp was also issued in booklets, containing panes of six stamps (Sc. #C60a). The carmine 7 C. denomination coil-format definitive airmail stamp, shown at bottom right (Sc. #C61), was issued on October 22, 1960. The 7 C. denomination commemorative airmail stamp shown above, at the left (Sc. #C53), was issued on January 3, 1959 to celebrate Alaska Statehood. The design features the Big Dipper, the North Star, a map of Alaska, and Alaskan scenery. The 7 C. denomination commemorative airmail stamp shown above, at the right (Sc. #C55), was issued on August 21, 1959 to celebrate Hawaii Statehood. The design features a warrior, a map of the Hawaiian Islands, and the star of statehood, which would later be added to the United States flag. The 7 C. denomination commemorative airmail stamp shown above, at the left (Sc. #C54), was issued on August 17, 1959 to celebrate the 100th Anniversary of the Airmail Flight of the Balloon Jupiter. The Balloon Jupiter carried a mailbag, containing 123 letters, during its flight from Lafayette, Indiana to Crawfordsville, Indiana on August 17, 1859. The flight was originally planned to go from Lafayette, Indiana to New York City, but it didn't make it, due to weather conditions. This balloon flight was officially sanctioned by the U.S. Post Office Department, thus this was actually the first airmail flight in United States history. The 10 C. denomination commemorative airmail stamp shown above, at the right (Sc. #C56), was issued on August 27, 1959 to publicize the 3rd Pan-American Games, held in Chicago, Illinois from August 27 through September 7, 1959. The design features a runner holding a torch. 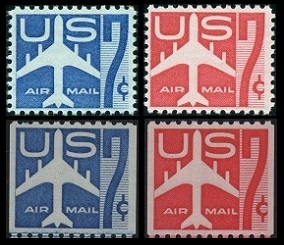 The five definitive US airmail stamps shown above (Sc. #C57-59, #C62-63) were originally issued (Untagged versions) between 1959 and 1961. The 10 C. denomination was issued on June 10, 1960, and its design features the Liberty Bell, with the inscription, "LET FREEDOM RING". The 13 C. denomination was issued on June 28, 1961 (Untagged) and on February 15, 1967 (Tagged), and its design features the Liberty Bell, with the inscription, "LET FREEDOM RING". The 15 C. (original design) denomination was issued on November 20, 1959, and its design features the Statue of Liberty, with the inscription, "LIBERTY FOR ALL". The 15 C. (re-drawn design) denomination was issued on January 13, 1961 (Untagged) and on January 11, 1967 (Tagged), and its design features the Statue of Liberty, with the inscription, "LIBERTY FOR ALL". The 25 C. denomination was issued on April 22, 1960 (Untagged) and on December 29, 1966 (Tagged), and its design features a portrait of Abraham Lincoln, with the inscription, "OF THE PEOPLE, BY THE PEOPLE, FOR THE PEOPLE", from the Gettysburg Address. With the World again at peace and the domestic airmail rate being reduced, the 5 C. denomination airmail stamp shown above (Sc. #C32) was issued on September 25, 1946. The design is similar to the wartime definitive airmail stamps, but this new stamp features a DC-4 Skymaster, reflecting the return to peacetime commercial aviation. The 5 C. denomination commemorative airmail stamp shown above (Sc. #C38) was issued on July 31, 1948 to celebrate the 50th Anniversary of the Consolidation of the Five Boroughs of New York City. The design features a map of the five boroughs, a circular band, and planes. The 6 C. denomination commemorative airmail stamp shown above (Sc. #C40) was issued on May 11, 1949 to celebrate the 200th Anniversary of the Founding of Alexandria, Virginia. The design features the Carlisle House, the Alexandria seal, and Gadsby's Tavern. The 6 C. denomination commemorative airmail stamp shown above (Sc. #C45) was issued on December 17, 1949 to celebrate the 46th Anniversary of the First Successful Flight in a Motor-Powered Airplane on December 17, 1903 at Kill Devil Hill, near Kitty Hawk, North Carolina. The design features Wilbur Wright (1867-1912), Orville Wright (1871-1948), and their "flying machine". The Wright Brothers flyer had a wingspan of 40 ft., weighed 605 pounds, and it was powered by a 12 horsepower engine. The flight lasted about 12 seconds, flying 120 ft., at an altitude of about 10 ft., and at a speed of 6.8 mph! The 6 C. denomination commemorative airmail stamp shown above (Sc. #C47) was issued on May 29, 1953 to celebrate the 50th Anniversary of Powered Flight. The design features the Wright Brothers' airplane and a modern jet airplane.